(Newser) – Japan and Australia have begun battling it out in the UN's International Court of Justice over the former's annual whale hunt. Commercial whaling was banned in 1986, but Japan continues to kill minke and fin whales for what it argues is legitimate scientific research, reports the AP. 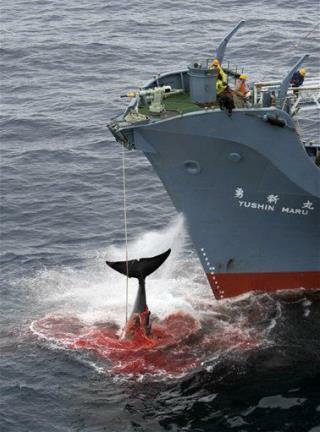 "Japan's research whaling has been conducted for scientific research in accordance with international law," Japan's Deputy Minister for Foreign Affairs said today. Australia isn't buying it. "Japan seeks to cloak its ongoing commercial whaling in the lab coat of science," Australia's agent to the court argued as proceedings began in the Hague today. The Japanese would fish the world's oceans and lakes to the point of extinction given the chance. These nips love their whale meat and the research issue is BS. These M Fers would kill every last whale on earth so they could have their whale meat. Enough with the slaughter of whales if you ever saw one in the wild like I have its like a religious experience seeing that massive intelligent animal I was overwhelmed by the experience. Please stop the senseless killings.